People often joke about "going with their gut" but the truth is that this part of your body exercises an astonishing degree of control over your mood, hunger, and general health. Written with the latest research on the microbiome-the alien bacteria that lives in our guts-The Clever Gut Diet also clearly explains what goes on inside your stomach and intestines every day. Discover up-to-the-date science on hunger hormones and learn how our "second brain" communicates with the rest of the body, shaping our appetite and immune system. 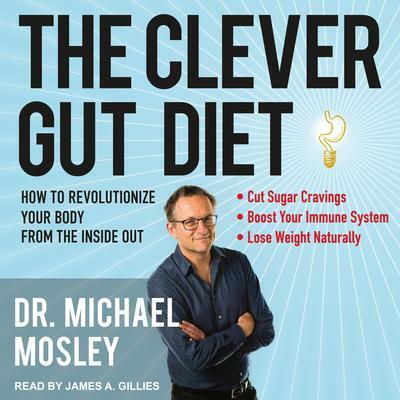 Although this is primarily a how-to book, Dr. Mosley uses his own body and experiences as a narrative, sharing his own personal journey of discovery. He explores prebiotics, probiotics, and the impact of antibiotics. The book also includes a comprehensive and delicious menu plan, provided by a leading dietician, which ensures that you will grow only the finest plants in your own internal garden. Finally, you can discover once and for all how to lead a life of optimal weight maintenance, improved physical health, and an overwhelming sense of balance and calm.